Not far from Na Hale O' Makena, Big Beach, also known as Makena Beach, or the best beach in Maui - it is truly in a league of its own. Located South of Wailea in Makena State Park, this vast beach is nearly 2/3 miles long and about 100 yards wide. Without a doubt, Big Beach is where you can go to have the true feel of a rustic beach in South Maui. There are no hotels in sight at Big Beach, giving you just the sand, the ocean, and the outer islands in the distance for viewing, it’s simply pristine. You can immerse yourself in a true Maui experience while sunbathing on this great beach. Big Beach has fantastic snorkeling, boogie boarding, surfing (when conditions allow), hiking trails, and the whale watching is top notch. Big Beach has a stronger current than most beaches due to its location, the water gets deeper more quickly, but these conditions make the water appear crystal clear and the whales come a little bit closer to shore than at most other beaches, making the whale watching phenomenal! Big Beach offers picnic areas, restroom facilities, lifeguards, and there is a $1 walk-in fee and $5 fee for cars. Hours are daily from 5am-9pm. Want to live near Big Beach or Little Beach? Nearby condos for sale can be found at: Na Hale O'Makena, Polo Beach and Makena Surf. This beach may seem tricky to find at first, but once you get there, you will be in heaven! Located in the Southern most part of Kihei, ending in Wailea, Keawakapu stretches about ½ mile long in a more residential area. The multi-million dollar homes that line the beach make it deceptive, but there is in fact an incredible beach on the other side of those homes and all of Hawaii’s beaches are public! Keawakapu suits the locals and tourists equally. It’s big enough that you can find a perfect spot and not feel crowded at all. The sand is unbelievably soft at Keawakapu, perfect for children to build sand castles, or just nestle your toes in. Many people love to bring their dogs to this beach and walk the shoreline (although there is a leash law). There is excellent snorkeling and in the mornings before the trade winds return, the water is incredibly flat, almost like glass. These water conditions make this the perfect beach to Stand Up Paddle (we call it SUP around here), Kayak, swim the shoreline, or simply take a dip! When Keawakapu gets a little swell, get the boogie boards out! There are actually three entrances to Keawakapu, the middle entrance which the locals call “Sidewalks,” is in fact a sidewalk between a couple of homes of South Kihei Road. Two of the entrances have paved parking lots and one is gravel. Though the hours of the beach state 7am-7pm, there are no gates to the parking lots, and you can clearly tell this time limit is not strictly enforced. Want to live near Keawakapu Beach? Nearby condos for sale can be found at: Mana Kai, and Wailea Ekahi. Polo Beach is a smaller beach fronting the Fairmont Kea Lani and the Polo Beach Club. When your looking to get away from the bigger beaches, this one is a must stop, but keep in mind that sometimes it can get quite busy as it is near the Wailea Blue Golf Course and two fairly large hotels. Snorkeling is good at this beach only when the water is flat in the early morning. Once the waves start to pick up, the water gets quite murky and tough for a swim, but in turn makes for great boogie boarding. There is a little more reef in the water at this beach, so make sure not to run in at full speed, take your time! Polo Beach has a large paved parking lot, restrooms, showers, BBQ’s, and picnic tables. Want to live near Polo Beach? Nearby condos for sale can be found at: Polo Beach Club. Kamaole Beach Park is split up into three separate beaches, Kamaole I, II, and III. Kamaole I is the largest of the three. Kamaole II is a little wider than the other two. Kamaole III at the southern most end has the largest grassy area that just beckons people to picnic, BBQ, play bocce ball, you name it and it’s done at Kamaole III! This area at Kamaole III is a favorite for the locals and you will see it on the weekends with numerous amounts of BBQ parties and a Maui favorite, jumping castles! The Kamaole Beaches are some of our personal favorites. All three are equally great for swimming, snorkeling, playing in the sand, and barbequing. The location of theses beaches are incredibly ideal as they are across the street from numerous condo complexes, residential areas and the Elleair Maui Golf Club as well. All Kamaole Beaches offer restrooms, picnic tables, BBQ areas, and showers. Want to live near Kamaole Park I, II or III? Nearby condos for sale can be found at: Kamaole Beach Club, Royal Mauian, Hale Pau Hana, Kihei Kai Nani, Maui Banyan, Kihei Akahi, Kamaole Sands, Maui Parkshore and Haleakala Shores. Kaanapali Beach pretty much has it all. 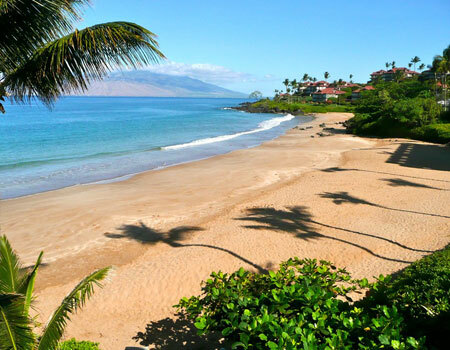 This beach lines the prestigious hotels of Kaanapali and access to them from the beach is a breeze. You can get some morning sun, a nice swim, and then either go shopping at Whaler’s Village by the Sea, or find any one of the fantastic restaurants seconds from the beach. Pretty much every beach activity you can think of is available at Kaanapali Beach. If you are a golfer, the Royal Ka'anapali Golf course is near by. You will see charter boats come into shore, parasailing boats offshore, jet skis and more. At the northern most end of the beach is Puu Kekaa also known as “Black Rock,” and is simply perfect for snorkeling. With all the luxury hotels lining the beach, it can get quite crowded at times, but it never fails to have all amenities available that you could possibly need. If you are not staying at one of the major hotels, there are several parking areas available for Kaanapali Beach that are public. If those are all full, be prepared to possibly pay up to $5 to park in a private garage. Though the beach does not have specific amenities that are tailored toward the beach, the hotels usually do. Most of the hotels have showers that will be clearly marked for public use. There are also restrooms available for public use. D.T. Fleming Beach on Maui’s West side is about 1 mile long. This is an excellent beach to stop at if you feel like getting away from the crowds. There are gorgeous ironwood trees that line the beach and provide great shade if the sun becomes a little too toasty. The waves here can be great for boogie boarding, when conditions prevail. If you are in the mood for a little golf, take a short drive to the Kapalua Golf Club Plantation Course. D.T. Fleming Beach Park has parking, BBQ areas, a playground, showers and a lifeguard. Surfers, snorkelers, and divers, this is your bay! Honolua Bay is located on the Northwest Shore about a 20 minute drive from Lahaina town. Not too far up the road is the beautiful Kapalua Golf Club Plantation Course, this is a must see if you are a true golfer. There isn’t really a beach here, more of a rocky shoreline, quite small. The best part is that this bay is completely protected and is a part of the Mokuleia Marine Life Conservation District. That means no fishing, and no taking anything from this bay, not even rocks! The protection of this bay makes snorkeling and scuba diving here incredible as you are pretty much guaranteed to see an abundance of fish and coral formations. The bay is quite large, so knowing where to go is key. The west end of the bay is much better for snorkeling, and the east end tends to be better for scuba diving as it is deeper. Snorkeling and scuba diving are better a little further from the shore as the visibility gets clearer. The summer months are usually best for snorkeling and scuba diving as the waves are not as large as they are in the winter months. Once winter months are here, Honolua Bay is a surfers paradise. The waves start to come in, and it is said that surfers love these waves because they offer a long ride. The land around the bay is elevated greatly and makes viewing the surfing incredibly easy. The crowds can get quite large at HonoluaBay in the winter months as many people come out to surf and also watch the surfers. Keep in mind that this bay is for experienced surfers! There are no amenities at Honolua Bay. Baldwin Beach Park is located right outside of Paia Town on the North Shore. This beach is about ¾ mile long. The water at Baldwin Beach can sometimes get a little rough, but keep in mind that at the western end it usually stays quite calm. The center of Baldwin Beach can bring in some bigger waves in the winter time that are perfect for experienced boogie boarders. Baldwin Beach offers full amenities, restrooms, showers, parking, BBQ areas and lifeguards. Ho’okipa Beach Park is located on the North Shore and is primarily known as the windsurfing capital of the world, and for good reason! There is surfing here year-round, and once the winter month’s role in, this North Shore beach becomes a haven for windsurfers, kiteboarders, and surfers alike, and has made this one of the North Shores favorite beaches. Wave heights can reach up to 15 feet at Ho’okipa, so if you are not experienced in the water, it is not recommended to enter. There are several professional competitions that are held at Ho’okipa Beach Park each year and many competitors come from all over the world to attend. This beach attracts quite the crowd during a competition. There is a small sandy beach here with a rocky shoreline, but not necessarily a great beach for everyday swimming. There are lifeguards year-round at this beach park. Kapalua Beach Park is a great beach to spend the day at. With the offshore reefs and lava outcrops, the waves and wind at this beach are minimal making this an excellent beach for swimming and snorkeling. The bay provides protection from the wind so the water tends to stay a little tamer than some other beaches. Parking can be somewhat limited at Kapalua Beach Park. There are showers at this beach. No lifeguard is present here. Want to live near Kapalua Beach? Nearby condos for sale can be found at: Kapalua Ironwoods, Kapalu Villas, Napili Shores, Napili Point and Napili Bay.